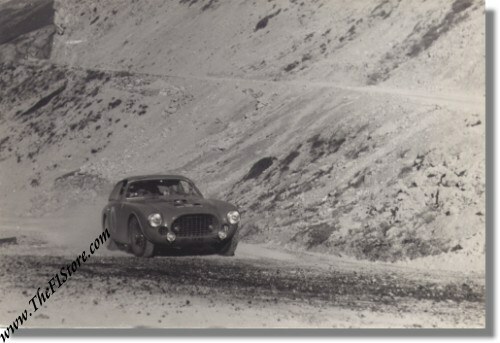 Vintage 1952 photo of Ferrari 225 Sport Vignale Berlinetta S/N 0164ED. This is a vintage July 1952 photo of the Ferrari 225S of Mr. Kleber, driven by Jean Lucas to victory in the Sables d'Olonne with race number 112. It is interesting to see that the car carries the (painted) temporary Italian license plate on the front which reads "BO 11890" which was a carry-over from the previous Italian owner, Franco Bordoni. This number contradicts other sources which mention "BO 11891". Somewhere in the mid-1950's the car was exported to the USA where it apparently still resides. The photo measures some 18 x 13 cm or 7 x 5 inches and is in mint condition for its age. There are NO references to the photographer.